A terrific Thai inspired peanut sauce makes this pork recipe outstanding. Serve it over stir-fried cabbage. Marinate at least 20 minutes. Remove pork from the skillet and set aside on a plate. Add the chicken broth, coconut milk, peanut butter, honey, and ginger to the skillet, stirring constantly until thickened about 2-3 minutes. When sauce has thickened add the cooked pork, stir well, lower heat and keep warm. In a separate skillet heat the remaining tablespoon of olive oil, add the green cabbage cook stirring constantly for about 2 minutes. Cabbage should be wilted but still tender crisp. Add the peas, rice vinegar, and soy sauce to the cabbage mixing well until heated. 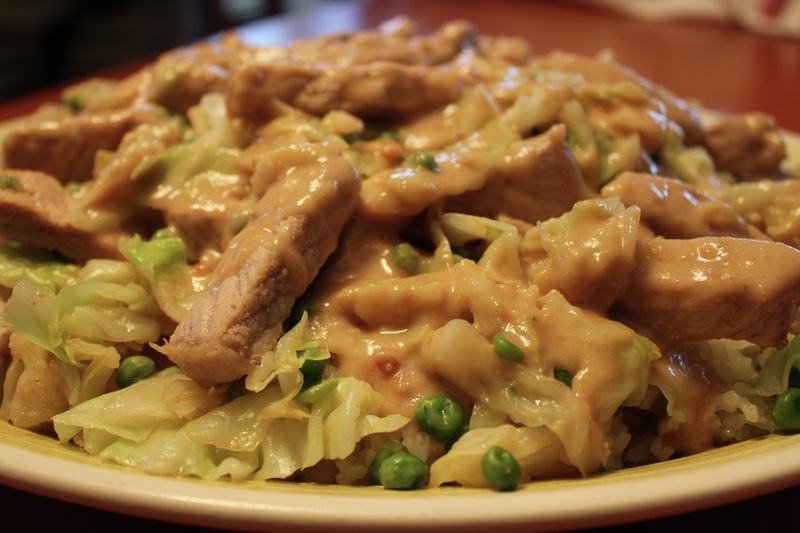 Serve the pork with the peanut sauce over the cabbage.